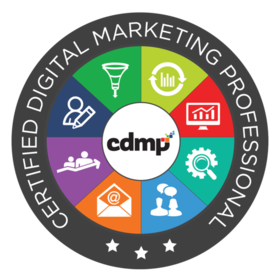 Certified Digital Marketing Professionals are uniquely qualified to help brands and businesses develop and execute a sustainable and comprehensive digital marketing program. Recipients of the "Certified Digital Marketer Professional” designation must complete eight advanced online courses (totaling 43 modules with 419 video lessons) and pass 34 quizzes, 8 exams and a specialized comprehensive final exam and final project that tests on the full spectrum of full-funnel marketing methods including Conversion Funnels & Customer Value Optimization, Content Marketing, Paid Traffic & Customer Acquisition, Social & Community, Email Marketing, Search Marketing, Analytics & Data, and Optimization & Testing. When combined with the education, this final exam and final project ensures the public that the recipient has attained a level of competence appropriate for professional practice.